Now this can get expensive - all the journals and pens - which to choose, if not all of them? Can't or don't want to spend $25 on a Moleskine or a Leuchtturm (say what...)? I'll point you in the direction of super affordable bullet journaling. Come this way! Choosing the journal you're going to use is probably the most important part of starting a bullet journal. You need to be happy with the design, if any, because there are a few. The Grid Layout - each page is presented in a lined-grid pattern that is great for keeping the structure of your layouts. The Dotted Layout - instead of lines, you get dots which are great if you don't like seeing all the lines from a Grid or Lined Layout. The Lined Layout - looks like a normal notebook. Horizontal lines run throughout. The Blank Layout - no lines, grids or dots and works great for those who like to freehand their layouts and/or draw. Moleskine and Leuchtturm journals are among the more popular brands of journals, but the most affordable similar ones I've seen are these. They cost $5, and you can buy about 3 or 4 for the price of one of the other brands. Want more choices? I wrote about 10 bullet journal notebooks under $20! Photo from Michaels. Click to view product. Any pen addicts out there? I would collect all sorts of pens if I had somewhere to put them and knew I would use them all. Alas, it would be a waste. However, if you're starting a bullet journal, these are some things to consider when choosing your writing tools. Tip size - pen tips range from super ultra microscopic to ohmygosh this pen is bigger than my journal. I prefer my pen tips to range between 0.3 mm to 1 mm. Brush pens are great too if you are good with calligraphy (I am talentless here). Color range - you gotta have all the colors, and there are so many to choose from. Grip - everyone holds their pen differently. Consider how the pen will feel in your hand before deciding. These are some great pens. Also, don't forget to go to the Michaels website the day you're going to stop in or shop online. They ALWAYS have a 40-50% off code for one item of regular price, but they change the actual code often. Use the code for the week/day to buy your pen sets. Bring a friend if you want more than one set, and friend can use the code to buy your pens for you. Winning! Oh, here is where we get down to the nitty gritty. Thinking about what layout to use can take over your life! No, I'm kidding. Every page is a chance to create something new. It's part of the beauty of bullet journaling. While there are certain elements to journaling, I advise you not to get too caught up in it, at least not when you're first starting out. This is where you figure out what works for you and what strategies keep you on track. If it keeps you on track, it is a successful strategy. Pick and choose which ones you need/want and see what works best. Ah the beauty of experimentation! Adding stickers to your bullet journal can really take it to another level. If you're feeling really lazy, there are printable layouts you can get. Just print and stick - ta da! If you're good with creating layouts on the computer, print 'em out on sticker paper, and you're good to go. For those who'd rather purchase instead of make, Etsy is the place to go. I have a handy dandly little shop called The AC Studio Design, and I focus on Boho style stickers, layouts and printables. This shop has super cute stickers, and so does this one. Their creativity is amazing! Most shops have sales often as well as coupons for repeat customers (my coupons are 20% after the first purchase), so look out for these extra savings. Washi tape is the ultimate lazy decorative tool. In just one strip, you take a blank page and make it pop. The variety of washi tapes available at Michaels is insane. Good luck buying just a few rolls, my friend. If you can draw a perfectly straight line, I'm jealous. 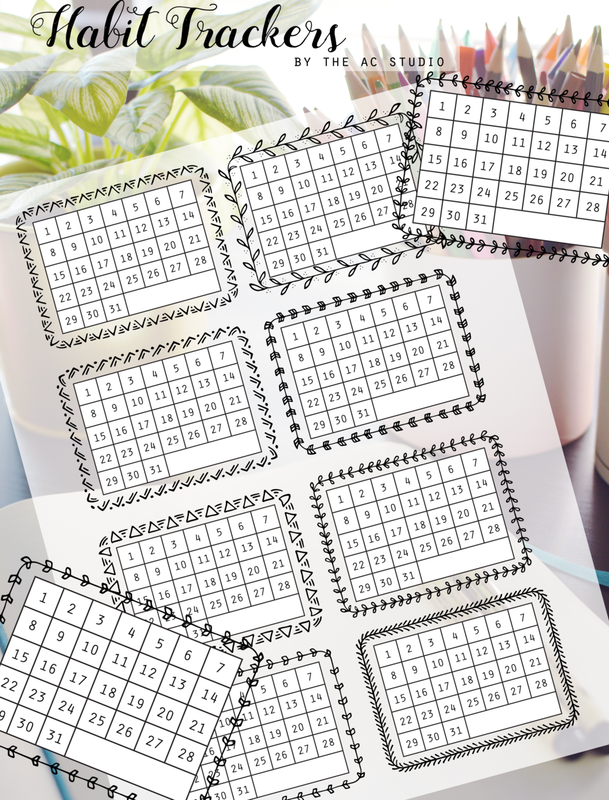 With bullet journals, it's probably easier to create layouts with a ruler or straight-edge of some sort and other template items (stencils for shapes, protractor, etc.). Scissors are useful for cutting out stickers and other artwork to be placed in your journal. They're also great for cutting out pages you don't want to look at anymore. There are a ton of bullet journalists out there who like to share their layouts and planning tips. Check out some of them here. So there you go - everything you need to start a bullet journal on a budget. Heck, you could start 2 or 3 journals for the price of one, which I know many people do. I hope you enjoy. Happy journaling! You don't get what you don't ask for, so please Pin this Post about How to Start a Bullet Journal on a Budget. Every share helps so much, and I thank you.